Black and glossy chess pieces look so elegant and luxury. Made of Teak wood and very durable for outdoor and indoor chess game. Beside used as chess game, this chess pieces also suitable for gift. May be you feel confuse about some gift in special event for one of your family, friend, or someone special. Try to give something different than other. Try to give this kind of chess piece to them. Sure that they feel surprised and never forget. 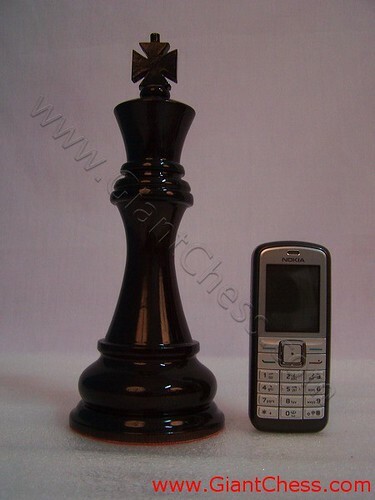 Wood chess pieces is our speciality and we have various sizes and models of chess pieces. We have standart chess models, staunton chess, decorative chess, custom chess in various colors. We have 8 inch chess, 12 inch, 24 inch, and many more. The picture show one of our collection. It is black and glossy King piece in big size. We have another color or you can decided your own chess models and colors. Buy our collection of chess set for your collection, or you want to decorate your house with our big chess pieces.